Anytime you are speaking or singing in front of the crowd, no matter the size, you want to be sure that you are delivering clear sound in a proper tone. Public speaking or singing voices are not something that we were all born with; many of us have to work at it. This guide will provide you with a few solutions if you are wondering how to project your voice. During inhalation, the diaphragm lowers and everything below it repositions to make room. You want to either speak or sing with your diaphragm, therefore, it is necessary to avoid ‘’breathing’’, instead take an inhalation that is deep and low. Taking proper deep breaths before each phrase supports your tone and increases your volume by ten-fold. The idea of breath support is muscle antagonism, which means two sets of opposing muscles working with each other. This requires a conscious effort to be made as it means to project your voice; you need a slow exhale which can only be achieved by resisting the muscles designed to push air out; to do this, use the biggest muscle of inhalation, your diaphragm. With slow exhalation, the rib cage should stay expanded and the chest should stay high. If you really want to project your voice, open up the back of your throat. The space behind the tongue creates a resonance chamber which propels sound forward, not unlike a hall that is well-designed to help sound reach the ears of your listeners naturally. To achieve this, imagine an egg stuck in your throat, pretend to smell a rose or imagine the feeling of a yawn. Opening up your throat will greatly project your voice. Pretending you are wearing a Mardi Gras mask will help you learn how to project your voice, as this is one of the easiest and quickest tricks of projection. Place your voice into the mask, which is located below the eyes and along the nose, as this is where vibrations are felt when speaking or singing. Opening the back of your throat while placing your voice forward into the mask will give your voice an intriguing, attractive and easy to hear sound heard by all. A good solution for how to make your voice louder is to use breath threshold. In order to create sound, the vocal cords flap together horizontally. Vocal cords flap together by air pressure and muscular resistance. The air coming from the lungs through your vocal cords causes them to open and shut. This process results in oscillation, which causes sound. Your pitch is determined by how fast or slow the vocal cords oscillate. To produce a voice that is projected and well-balanced, it is important for you to find just the right amount of air pressure verses muscular resistance. You can sound “breathy” if you allow too much air to flow through the vocal cords or “pinched” if you are using too much muscular force. Too much muscular force can also cause damage to the vocal cords over time. You should attempt to sound “breathy” and “pinched” purposefully and then attempt to find your happy medium between the two. To achieve a voice that is beautiful and loud, the trick is to sing with as little breathiness as possible, without tension. It is found that most people don’t use the tools of articulation such as their jaw, tongue and lips with enough energy to produce consonants that are crisp and clear. Articulation has a direct effect on how well your voice carries. By putting more energy into your muscles of articulation, you are lifting your voice up away from your throat muscles and into the resonators in your face, which include your cheek bones and sinus cavity. Cheek bones resemble the sounding board of a piano and your sinus cavity resonates like a big, open room, which creates a voice with more resonance that will project better to listeners. Avoid trying to push your voice to become louder as this will most likely make you hoarse and may even do damage to your vocal cords. 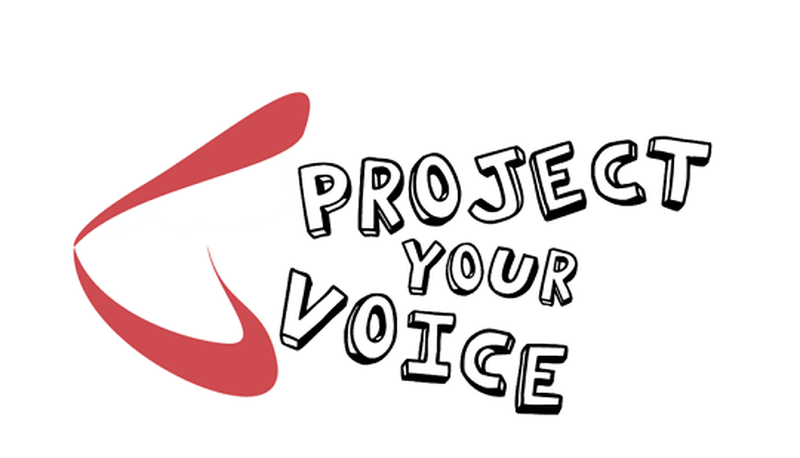 To project your voice, imagine that the inside of your mouth and throat are as large as the room you are speaking in. This causes all of the muscles around the inside of your throat to pull away as if you were yawning. The bigger the space you have inside, the bigger the voice will be outside.